19h00: Dinner with the participation of Deputy Prime Minister of Belgium, Laurette Onkelinx, leading politicians from Belgian Socialist Party, Turkish Civil Society Representatives. Europe today is at a junction: Either it is going to be swept along by the current of history, or it is going to direct that flow.At this point in time,we politicians have huge responsibilities. It is the duty of us socialists and democrats to transform Europe into a project that inspires and generates development, welfare, stability and justice. In this rapidly changing and globalising environment, the issues of our era are diversifying and becoming more complex. Today, even if some of the underdeveloped countries are tasting the fruits of economic development, hundreds of millions of people still live in the spiral of inequality, poverty, and distress. The internet, social media, mobile technologies, nano-technologies, and the quest for green energies that have been contributing to the progress of humanity, are at the same time creating a new consumer society. While globalisation has been creating opportunities, it has also been bringing complex problems with it. Unequal relations continue to exist between the Northern and Southern hemispheres. We are still combatting issues caused by hunger, poverty, dictators, injustice, civil wars, violence against children, women and civilians, as well as the deterioration in the earth’s eco-system. It is because of all these developments and issues that humanity needs a more effective, more creative and more just Europe. As the birthplace of democracy, human dignity and social justice that form the basis of universal values, Europe has always been a driving force for development and progress. It is this verity of Europe that we in a multitude of ways feel and experience in Turkey. This year is the 50th anniversary of the association regime Turkey established with the European Union. Let us not forget that Turkey – European Union relations are relations that go beyond the target of full membership. For centuries, we wrote our history together and shared a common fate. In an environment of global competition and a race among civilisations, a Turkey that is a full member of the Union will strengthen Europe in many ways and create added value for all humanity. Turkey’s full membership will increase EU’s social and economic power, its geo-strategic projects, but most importantly, shall add to the global attraction and impact of Europe’s universal values and norms. 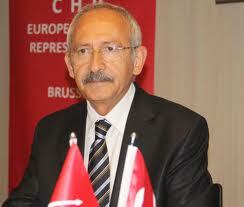 CHP, Turkey’s social democrat party with progressive political dynamics,b elieves in this perspective. It was in 1963 when CHP was in power that CHP started Turkey’s accession to a great undertaking of peace and democracy that was to develop into a political union. CHP has always supported this process. EU policies of recent years, unfortunately, have not been effective in guiding Turkey towards European values and standards. On the other hand, the ruling conservative AKP government started practicing its anti-democratic culture and spreading it to the entire country. In the meantime, through a variety of channels, the AKP government and its supporters have been carrying out an intensive disinformation campaign in Europe, with Brussels as the major focal point. AKP has made an effort to portray itself as a “democratic force in Turkey” while they have tried, with an intent to mislead, to label the opposition, as a “militarist party, opposed to reforms.” It is sad to note that this campaign of disinformation has been effective in some circles. Dear friends, we are living in the Information Age. 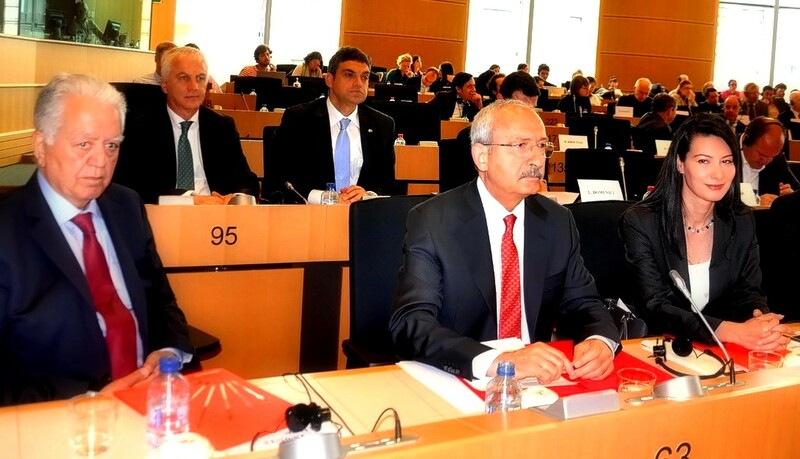 CHP’s ideology, entire discourse, attitude, votes casted in the parliament and all of its proposed policies are on record and accessible to the public. CHP is the only political movement in Turkey that has truly internalized what democracy is all about. CHP is the leading party in Turkey that defends the true meaning of democracy. And now AKP disinformation is continuing on the Kurdish issue. They are trying to create an atmosphere as if “they are the ones who want a solution, but that we the CHP are, allegedly, against a solution.” Feeding even such a big lie is not all that difficult in present-day Turkey where there is no freedom of press, where auto-censorship is becoming prevalent, and where journalists who criticize the government are either fired from their posts or put in jail. Firstly, CHP is the only party that has actually made proposals for the resolution of the Kurdish issue and shared them with the public. We made clear that ethnic discrimination and racism constitute grave crimes. We proposed a wide range of concrete policies: from the teaching of the Kurdish language to cultural rights; as well as expansion of the environment of individual liberties. Our basic references on the topic are clear: they are the EU’s Copenhagen political criteria. Secondly, CHP believes that the solution to the Kurdish issue can be made lasting and sustainable with a new constitution that would strengthen our democratic, parliamentarian regime. AKP, on the other hand, is bargaining with the PKK for an authoritarian, anti-democratic Presidential system with unchecked powers. Thirdly, we shall support all sincere steps taken towards the solution of the Kurdish issue. However, AKP insists on not sharing information with the public or CHP and refrains from bringing the matter to the Parliament in Ankara. The fourth is a very important point. 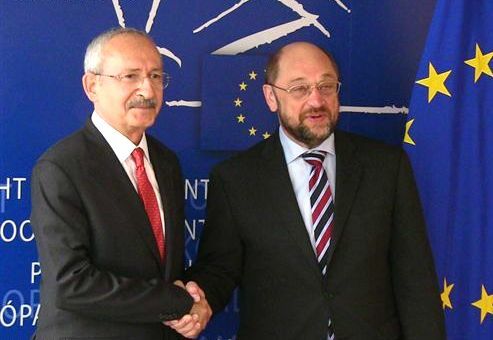 With total disrespect for the rule of law and under the cloak of secrecy, AKP is engaged in a bargaining process with the PKK – which is declared as a terrorist organization by the EU and by the US. CHP, on the other hand, under all conditions, wants the implementation of law and, as a state of law, wishes to remain within the confines of law and legitimacy. Fifth, it is not possible to bring about lasting social peace and reconciliation in the existing oppressive, anti-democratic atmosphere dominating the media and the society –conditions also emphasized in the EU reports. Last but not least, is the fact that 100% of the CHP electorate is in favor of a democratic constitution. The CHP electorate is keen on realizingstrong and lasting social reconciliation and peace – with the Kurdish issue, at the top of the list. As a party, the CHP is under many forms of pressure. The oppression on the media restricts our communication with society at large. Two of our parliamentarians have been imprisoned for the last five years. Yet there is no court verdict against them. All rules of universal law are violated. Our MPs in prison are wasting away in small, isolated cubicles. There are thousands of other innocent people imprisoned like them. The AKP is carrying out a “witch hunt and practicing “McCarthyism”. People are living in fear. In addition to AKP’s poor report card on democracy, The United Nations Annual Human Development Index displays AKP government’s failures in a concrete and objective manner. Turkey has the maturity and the democratic background to overcome these problems. In recent years, the EU is experiencing internal weaknesses in managing economic affairs, unemployment, xenophobia, and rise of extremist political movements. All these have, unfortunately, had a negative effect on Turkey, too. We are all on the same boat; we are focused on a vision for a stronger democratic future, sustainable social development, and a society of law. The international order in the 21st century is rapidly taking shape. On the one hand, there are issues devastating the lives ofcivilians in Syria, Iraq, Mali, Palestine, and Afghanistan. On the other hand, important economic bodies are being formed, especially in the Western world. The Transatlantic Partnership between the US and the EU, EU’s free trade negotiations with Japan, and the Trans-Pacific Partnership under the leadership of the US,may bring about new shared standards to international trade and investment. The scope of these initiatives should not deal with customs tariffs only, but should also include consumer rights, social arrangements, as well as rules for the environment. It is in our hands to approach these new economic structures with a more egalitarian understanding, and turn them into opportunities that would serve the welfare of the peoples of the world. 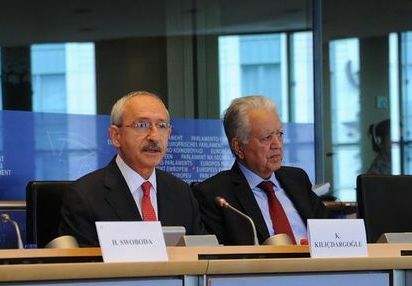 It is with this understanding that, within the framework of Turkey’s customs union with the EU, we advocate Turkey’s inclusion in the Transatlantic Trade and Investment Partnership between the EU and the US. As CHP, we are the party next to govern Turkey. We shall make our country contribute positively in all fields, to the future of Europe. We have concrete policy proposals and action plans in every field. Under a CHP government, Turkey shall not be an instigator of war, but the protector of democracy, social development,and peace-keeping actor in its region. 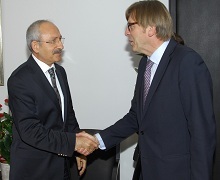 an EU that gives priority to communicating with the Turkish people. 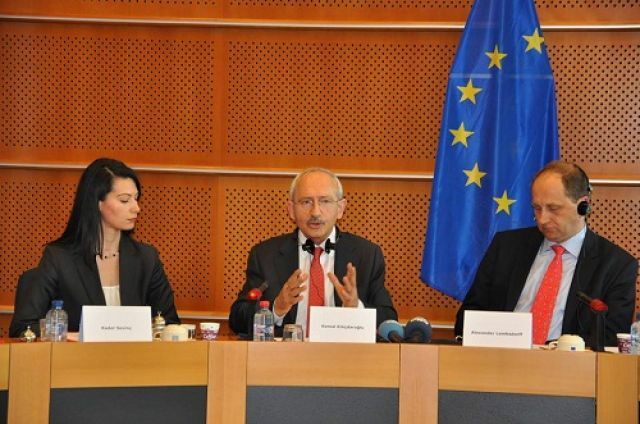 an EU that would remove illogical visa practices for the citizens of the Turkish Republic. 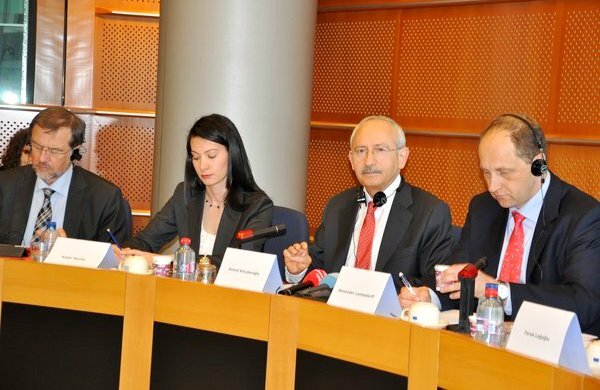 I would like to thank you for giving me the opportunity to share my thoughts and messages with the Progressive Alliance of Socialists and Democrats in the European Parliament, the most effective and influential actor in to convey them in Europe. I would like to extend to all, my dear comrades in the Socialists and Democrat Groups, the greetings and the best wishes of CHP. I also would like to express my wish to see you and host all of you in Turkey. Gallery | This entry was posted in Uncategorized and tagged brüksel, chp, kemal kilicdaroglu, konuşma. Bookmark the permalink.